Thought I would start this topic as I plan on having a bigger garden this year. Had so many things going on last year that I didn't have the time. I'm making time this year. Dianna traded a rarely used box blade for a 5' disc harrow a year or so ago and I got a chance to use it last week. I normally use a tiller to get the ground ready but sold the old worn out Hinimoto tiller with the Yanmar tractor. If this disc harrow works I may be able to get by without buying another tiller for the tractor. Anyway one night last week I put the disc on and ran it through the garden spot several times. This is what it looked like after several passes. I ran the disc back over it again on Sunday afternoon and it looked better. Still not sure if I will have to get a new tiller in order to use my planter. I also have one more spot to get ready for my corn patch. I'll add that once I get it done. I hope to have the garden planted sometime around the second week in April. Looking good. I hope to start next week. I decided to widen the garden spot instead of putting the corn in another area that way if I have to water, it makes it a bit easier. I have a "middle buster" plow for the tractor so I put that on and ran it through before using the tiller. It is designed to go down the middle of a row and roll out potatoes but it did a pretty good job of finding the roots from the sycamore trees that are close by. I pulled some out that were 2" in diameter. Once I got the plow through it, put on the disc harrow and ran over the entire spot again. 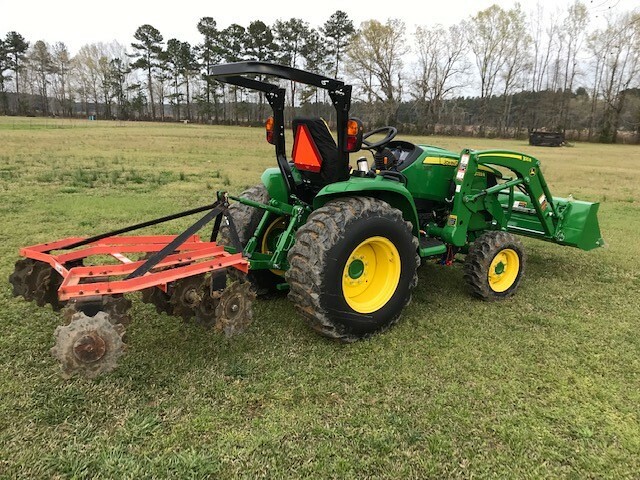 It looks better but I'm not sure if I am going to get by without purchasing a tiller for the tractor to get it ready for planting with the planter I want to use. I have a small tiller for getting between the rows after planting but that would be rough trying top use on the entire garden before planting. I'll get some more pictures soon. Not much action on the garden. It's too wet to do anything. I decided to wait on the tiller as it appears that it may be too wet to do much with it. If it dries up some I'll just use my small one. We got over an inch of rain last Friday. I had just finished mowing the front 5 acres. The back 3 still needed it, but was too wet. Since they cut all the timber behind our land we have lots more water standing and for a longer time. The timber soaked up some of the water I guess. They are calling for more storms and rain on Friday again. I hope it misses us as I really need to get the garden planted. 15 April was my target day but I should still be ok if I can get it planted next week. Good luck. I read somewhere that tree roots absorb a significant amount of water which is contributing to water issues around here as we lost so many trees. We have standing water in places that never did before. Can you maybe plant a few trees along the back of the property? They left a line of trees along the property line but the sheer numbers of trees they took out is what is affecting the natural flow of the water. Same problem you are seeing with all the trees that went down during the hurricane. I guess these are typical spring storms but it sure feels like we are having more than usual. I remember the first garden I did after we moved here, I was watering every other day. We even had the neighbor turn the water on while we were gone to FL the first year. Last year it was so wet in the spring that I couldn't get anything planted so I just gave up. I'm hoping we don't have as much rain as they are calling for on Friday so that I can possibly get things planted next week. We have storms, some possible severe (possible tornadoes) coming through early Fri. morning. I wonder if its the same system. It probably is. Forecast for us says high winds and possible tornadoes, then heavy rain. My weather station predicts .88 rain for us. I hope that is wrong though. We got a little over an inch last Friday and it's still not dry enough to get in the garden to plant yet. Once we get through today we should have a few days to dry out before the next one so I hope to get it planted next week sometime. I still need to run the disc through it again with some weight on it to break it up a bit more. Just before planting, I can run my small tiller through it to lay off the rows. How many acres do you mow Jim? Was the timber cut to sell or is someone building? We're fortunate that we don't have standing water. We're sort of up on a hill and I guess that takes care of it. 7.96 acres according to the deed. We were told they cleared the land behind us to construct a duck pond for hunting. They have done that to lots of the forest/farm land around us. Within a 10 mile radius there are probably 5 large fields that they have built a burm around, flooded with about 5 inches of water, planted corn and built duck blinds. We heard that a guy from Charleston is the money behind it and he leases the blinds for $20,000 per season. Anyway, they are saying now that he sold out to someone else but we haven't been able to get any info on what they intend to do with the land. Finally was dry enough for me to get back in the garden yesterday afternoon. I ran the disc harrow through it again and it really is ready to plant now. I'm planning on planting tomorrow night and Thursday night, just in time for the rain they are forecasting for Friday. That's a lot to mow. Planting didn't go as well as planned. I ran out of corn seed so have to pick up some more today. Planted 2 rows of lima beans and they wouldn't go through the planter. Was rough on my back. 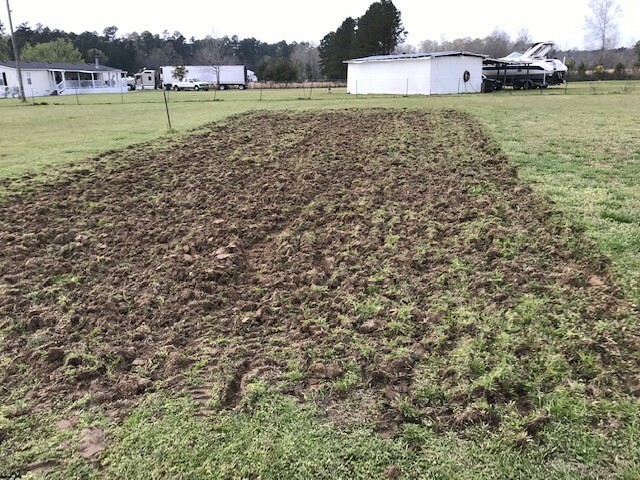 Started planting 3 rows of crowder peas but it got dark and the planter was acting up again so I will have to re-do that tonight. Haven't found the tomatoe plants that I want either so it may be the weekend before I get them in the ground.